The food journal of an Oaklandish bachelor who hella loves cooking! Many of my recipes are inspired by something I’ve been served at restaurants or a friend's table. It is the challenge to recreate a dish in my own way that I find so intriguing, but sometimes my inspirations don’t turn out anything like what I first envision. This recipe is the result of several mistakes and a lot of persistence. My muse for this recipe came while having dinner at a nice restaurant on Polk Street in San Francisco. 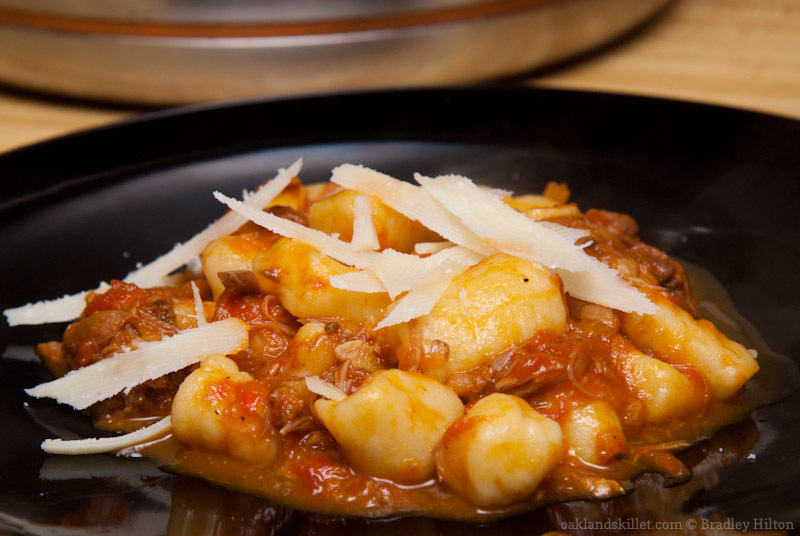 On the menu was a ricotta gnocchi served in a pork ragu. I have always wanted to try making gnocchi and a simple ragu seemed like just the thing for a first attempt at gnocchi. My original idea was for a potato gnocchi in a duck confit ragu. I figured the duck would make a fine substitute for pork. Both are rich, flavorful, and fatty meats. Since this undertaking was planned for a weeknight I thought starting with confit would save a lot of time where pork would take many hours to braise and become tender enough for ragu. I still think my intuition was reasonable, but I made some crucial mistakes in my approach and hastily procuring the ingredients. I knew this the moment I opened the hermetically sealed vacuum bag containing two dry overcooked duck legs almost completely devoid of fat. The ragu wasn’t going to work out. No amount of braising would bring this foul back from its state of cooking induced rigor mortis. My next mistake was thinking that since I’ve become very good at making fresh pasta the gnocchi were going to be a cinch. Wrong! I way underestimated the amount of time necessary to roll out a full recipe of gnocchi. While I rolled out the gnocchi I allowed the ragu to simmer uncovered. This required several additions of wine and chicken stock to keep the ragu from turning to paste. As the liquid reduced the flavors became far too rich and unbalanced. As for the potato dough, I lacked a crucial piece of equipment. I used a potato masher which left chunks of potato in the dough that made for an irregular texture. A potato ricer would have produced a much more uniform texture. The potatoes were also too wet which required too much flour to bring them into a dough. This gave the gnocchi the wrong texture and taste of doughy raw flour instead of a firm texture with distinct potato flavor. I served the gnocchi that night, but I wasn't satisfied with the results. I may have taken on too much at once. I gave some more thought to my attempt: I still had half a batch of gnocchi in the freezer. All was not lost. Later that week I decided to try again at the ragu. This time I aimed to correct the balance of flavors. I decided to use chicken in place of the duck. Minding the cooking time for the sauce and keeping it covered made all the difference. The gnocchi were of the wrong texture, but still edible. The ragu, however, was delicious! This will not be my last post concerning gnocchi. I'm still looking for a better source of duck confit. I still need to procure a potato ricer, and get more practice making the dough and rolling out the gnocchi. While not everything went as planned I did end up with a recipe that I feel quite proud of and have made several times since. While producing an incredible dish is always the ultimate goal in my culinary adventures it is the lessons like these that serve to humble my skills and remind me of why I find cooking so fascinating.